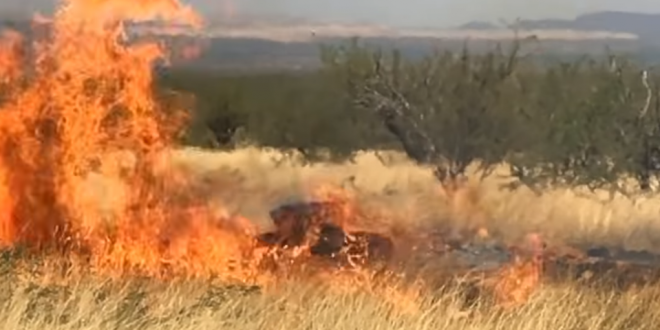 Video Captures Start Of 47,000 Acre Wildfire Sparked By Border Patrol Agent's "Gender Reveal" Explosion - Joe.My.God. The Sawmill Fire is shown erupting from an exploding target — with blue smoke curling off the fire’s fringes — in a video just obtained by the Arizona Daily Star. The Star obtained the video from the U.S. Forest Service through the Freedom of Information Act. Border Patrol Agent Dennis Dickey, who has admitted starting the fire with an explosive target, ignited the blaze during a gender reveal party that was held to show the gender of his wife’s expected baby, his attorney Sean Chapman told the Star in September. The fire burned 47,000 acres and cost over $8 million to contain. Dickey has agreed to pay a fine of $220,000 and pleaded guilty to a misdemeanor. The explosive he used has been linked to other wildfires.